Early-mid18th C, Elm, Shanxi. “Duawen” crackling look and screen paintings with “Scholar’s Rock” treasured by Ming/Early Qing literati; original. This cabinet is constructed in the ‘Si-ping’ (four-sides-square) style, with flushed door panels fitted with pivot hinges. There is no central removable stile. The brass lock-plates and pulls (in the form of confronting dragons) are original. The framework of this cabinet is plain. The door panels are decorated with paintings of birds and water-fowls frolicking among flowering trees and shrubs, and big scholar’s rocks by the shore of a pond, resembling screen paintings. It is all against a dark lacquered background. The painting is very well done with understated shades of reds and blues, highlighted with gilding in a technique similar to “Miaojin” (lit.’trace in gold’), a technique using colored lacquers highlighted with finely drawn gold lines to depict painterly scenes against a solid lacquer ground. This technique was popular during the Ming period. A touch of white color draws the eyes to the scholar’s rocks on one of the panels. Scholar’s rocks are prized by literati of the period; highlighting it on the panel suggests this cabinet was made at the request of someone of the scholar/ high official class who collected these highly priced rocks. 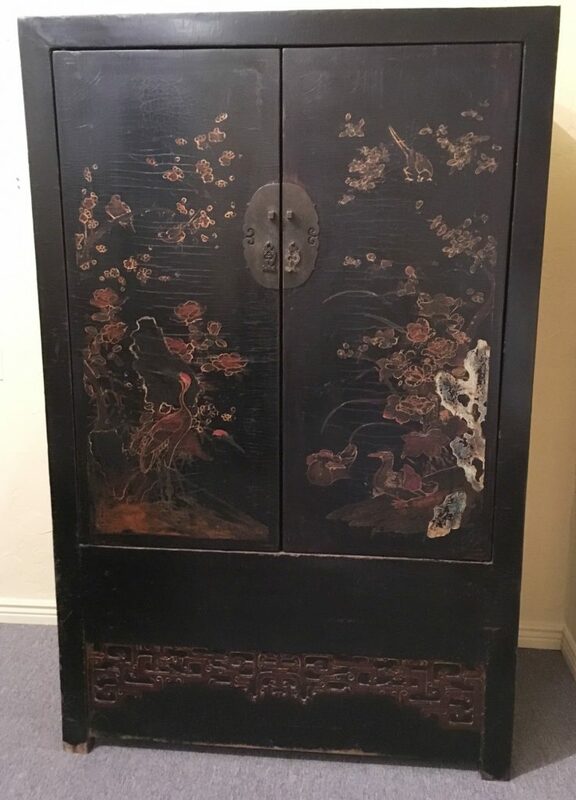 The crackled look on the door panels came from the fact that this cabinet has thick layers of lacquer (always a sign of good quality as lacquering is very labor intensive, so the more layers, the more costly), which tend to crack with age. According to the author, Craig Cunas who wrote a series “Chinese Furniture” for the Victoria and Albert Museum, a somber tone on black lacquer and crackling is a look treasured by Ming and early Qing literati who considers “duawen”, the distinctive crackling seen on old lacquer, highly desirable as it is testimony to the antiquity of a piece. Below the pair of painted doors is a plain black lacquered horizontal panel, which hides additional storage space behind. The smooth surface of the dark panel contrasts beautifully with a recessed wide apron below, which has red pierced carvings of a stylized ‘long life’ character in the center, embraced on either side by running dragons. (The “running dragon” design was a prevalent design during Qing Emperor Qianlong’s reign.) The framework and side panels have some lacquer slightly peeled off from aging. The fine crackling lines on the front give the piece a ‘snake-skin’ look, and also impart a sense of waves rippling on the top of the pond. The interior compartment has two shelves and a removable board hiding extra storage space. This all-original cabinet survived with a wonderful patina. The somber matte-finish look on the decorative door panels is the result of transparent lacquer darkening with age, a degenerative process lacquer specialists agree result in clouding the tonality of the lacquer finish. This cloudy look should not be covered up by any restoration means or it would diminish the value of the piece. It is always best to leave an antique in the original state it is found, unless a restoration is necessary for preservation. In our case the crackled lacquer on the front panel has been secured and prevented from peeling by a reputable antique restorer.